There's no doubting the stature of Chinese master directors Zhang Yimou and Chen Kaige. These two stalwarts of the Fifith Generation of Chinese filmmakers burst onto the cinematic landscape with 20th century-set films Red Sorghum and Farewell My Concubine respectively. 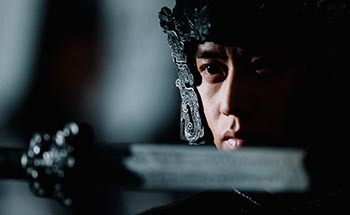 But arguably they are best known in the West for their martial arts costume epics Hero and House of Flying Daggers (Zhang) and The Emperor and the Assassin and The Promise (Chen). Both men are back playing in the period piece sandbox with two films at Toronto -- Zhang's Shadow and the all new director's cut of Chen's Legend of the Demon Cat. It's great to see the masters back at it. But perhaps it's most notable that the films share both some remarkable differences -- and some striking similarities. 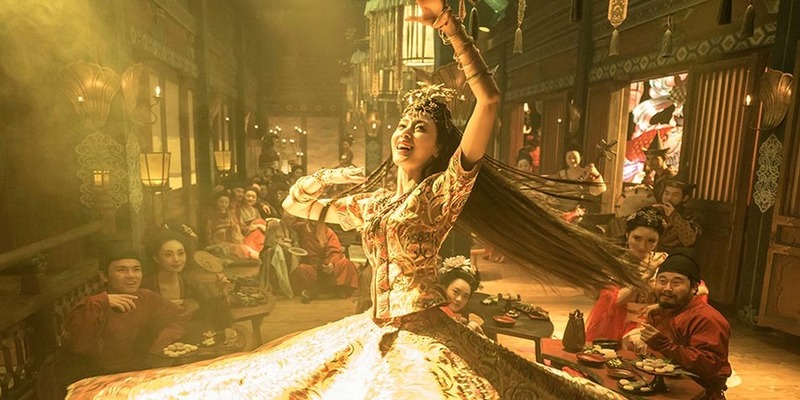 For Zhang, it has been a over a decade since his last martial arts epic, Curse of the Golden Flower (assuming you are able to overlook last year's Matt Damon-starring monster movie The Great Wall). In Shadow, his hyper stylized visual tactics are back, though they are notable for the restraint he shows. Influenced by Chinese ink-wash paintings, Zhang desaturates his mise-en-scene to the point where it appears almost black and white. This contrasts to striking effect with the natural skin tones of the actors' minimally exposed faces and hands, the occasional vibrant green plant, and of course the scarlet of the blood that is so often spilt. Adopting quite the opposite tactic, Chen's Legend of the Demon Cat is one of the most colorful movies in recent memory with his imperial red uniforms, opulent gold sets, blue monk robes, and, you guessed it, scarlet blood. Of course modern computer imagery and color techniques play an enormous role in the visual design of both films. But while Zhang makes efforts to minimize the impact leaving audiences asking, "did that actually look like that?" Chen dials it up to 11 and asks audiences to give themselves over to his sumptuous fantasy world. While Shadow is a Shakespearean tale of revenge and Legend of the Demon Cat a light-hearted supernatural mystery, both films share one large narrative trait. They are both pretty damned confusing. It's been said this new director's cut of Legend of the Demon Cat goes a long way to solving the narrative foibles that marred the original release (a version I have not seen), but I still found myself scratching my head trying to figure out which characters in the main timeline were connected to the previous timeline and why exactly the Demon Cat was after them. Eventually I just gave up and enjoyed how incredibly pretty the film is to look at. The plot is certainly not incomprehensible, it's just not really important enough to worry about. Likewise, in Shadow, there are some pretty big narrative hurdles to clear in understanding the machinations of the story's raging war. This is not helped by the stylized desaturation, the enormous headgear the characters wear, and the fact the plot involves characters who are supposed to look alike. Luckily there aren't quite as many characters to keep track of, and the dialog-rich first half of the film eventually gives way to an action-packed second. Both Shadow and Legend of the Demon Cat (the director's cut, at least) provide an interesting opportunity to check in with two great Chinese filmmakers and see how they have progressed as directors. While it's no huge surprise that these kind of epic action films find them focusing more on dazzling visuals than taut storylines, it is encouraging to find them both trying new things with such an old genre. Just sit back, enjoy, and don't ask too many questions.